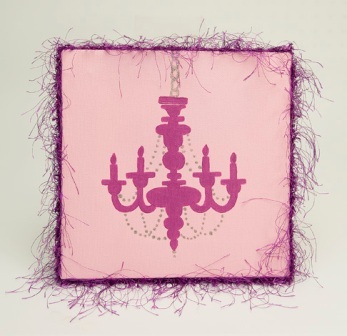 Adorn a little princess's room with a pink chandelier silhouette wall canvas. The look is fun but not too cute. Older girls will enjoy the painting. Use flat brush and Poodleskirt Pink to paint canvas top and sides; let dry. Trace pattern onto center of canvas. Use round and shader brushes to paint inside outline with Vivid Violet; let dry. Use Silver Craft Twinkles Writer to embellish chandelier with dots forming chains draped at bottom and to paint chain links at top. Let dry. Spray canvas with Americana Gloss Spray Sealer and let dry. Use glue to attach fringe around side edge of canvas; trim ends as needed. The pattern can be found at... http://www.decoart.com/cgi-bin/Projects.cgi?GirlsChandelierSilhouette. Looks very cute! If my 3rd baby is a girl, I just might have to make this! Is there a pattern for the chandelier other than the picture that is shown? I'm having a hard time working with such a small pattern. I've tried enlarging the picture but it would be much easier if an actual larger pattern is posted. Thank you very much and I LOVE this site.